Finally...the July cloth is done! 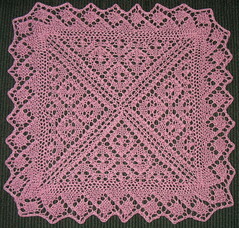 The pattern is charted...only 4 rows...although it is a 13 st repeat plus 7. 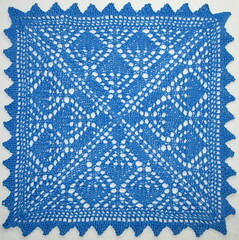 This is done with DMC's Senso 100% cotton (size 3). I paid $2.75 for 150 yds. I probably have enough left over for a half of a cloth. 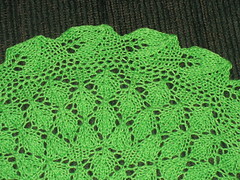 Or maybe it would be enough for a lace edging for a pillow or towel???? 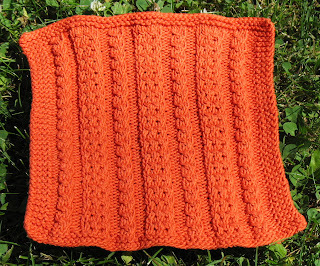 I could see using this rib for the tummy part of a summer top...or the whole thing! Unfortunately my summer time is already filled. I got volunteered to be the craft person for our VBS. This coming week is the last time I have to be sure all 5 days of crafts are ready to go. We only used 1 of the preplanned crafts. So it was a lot of brainstorming and preparing these past couple of weeks to come up with 4 other appropriate crafts. We (my dd and myself) are off to a Higher Things youth group gathering at the end of this month. VBS starts 2 days after we get back...yikes! And then there is Stitches Midwest the day after the final day of VBS....I think I'm going to have to pass this year....sigh. And our youngest dd is freaking out about me being gone...that just adds the final touch to my already too busy summer. 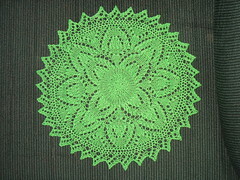 I am new to the world of knitting (learned January 2008) and have been scouring the internet for easy patterns. I've mastered the basic stitches, and have done diamonds and hearts and a couple of cable knit washclothes, but the one thing I cannot do, and have no idea how to go about learning, is how to read a chart. I came across your Little Twisted Rib pattern the other day and was wondering if the directions are written down anywhere since reading the chart is more "challenge than I'm ready for right now. (I've gone back to school and my mind can only untangle so much new stuff right now) Any help you can be would be appreciated. The charted pattern is the only way I've got this pattern. As for learning how to read charts... you could print out a copy of Lean to the Left cloth pattern both ways...with the chart and with words only and then try knitting from the chart. If you get stuck with the chart you can consult the written out directions. Charts can seem scary at first but they aren't so bad once you get used to them. 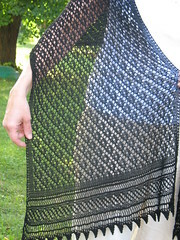 The Lean to the Right cloth has both kinds of patterns as well. I'm a novice knitter and came across your dishcloth pattern, which I'm looking forward to trying. I was most excited, though, to find that your are LC-MS!! I am, as well, and when I clicked on your church link, I discovered that Chris Raffa is an associate. He was a classmate of my son's who is also an LC-MS pastor!! Cool!